I’m very pleased with my reading for March. Once again, I came within one book of breaking even on my acquisitions. I would have made it with plenty to spare, had I not caved in to the feminist SFF book bundle being curated by Cat Rambo. I’m especially pleased because I also had a bit of reading to do for the Ditmar Awards. However, all bets are off in April. 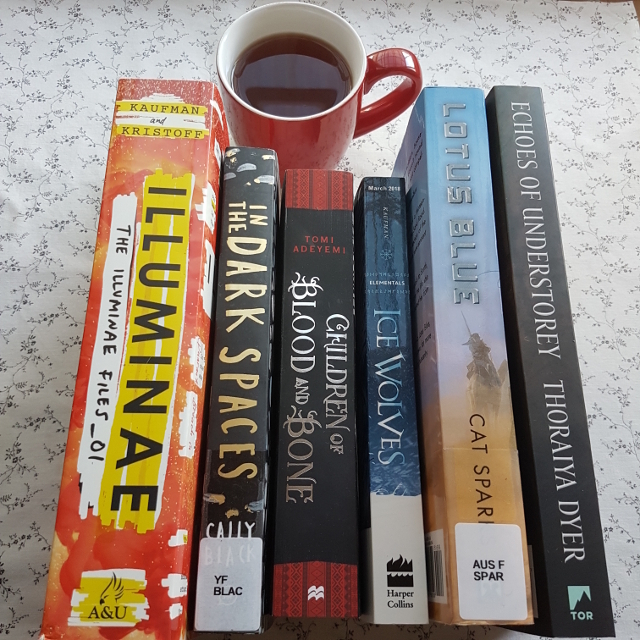 The shortlists for the Hugo Awards have been announced and I requested 25 items from the local library to get a jumpstart on them while I wait for the Hugo voting packet to be organised. Even with the boost of Dewey’s Readathon at the end of the month, I expect Mt TBR is going to rise a fair bit. 21. Sweet Disorder by Rose Lerner. First book in the Lively St. Lemeston series. This is a delightful historical romance about a very curvy widow and a former soldier struggling to get his life back together after being injured in the war. I loved the way it pushed back at some of the tropes of historical romance by focusing on characters that don’t normally get much attention: Phoebe is not nobility and Nick barely qualifies. It was also wonderful to see disabled characters receive representation. Not only does Nick have a limp and chronic pain, but one of the side characters uses a wheelchair (and was such a charming character that I was a bit disappointed her story got resolved, so she won’t be getting a book of her own). There was some interesting narratives about unhealthy family relationships and overall, I found it both charming and thoughtful. Thank you to Gin Jenny at Reading the End for the recommendation. 23. Elementals: Ice Wolves by Amie Kaufman. Reviewed here. 24. On a Barbarian World by Anna Hackett. The sixth book in The Phoenix Adventures. Sci-fi romance. Aurina Phoenix is a scout for her brothers’ deep space convoy. When she crash lands on a low-tech planet, she finds herself at the mercy of the barbarian warlord Kavon. While the book tempered some pulpy sci-fi tropes with a modern feminist interpretation, I don’t feel it was wholly successful. However, I’m also not a fan of the tropes to begin with. 25. Echoes of Understorey by Thoraiya Dyer. Reviewed here. 26. How to Bee by Bren MacDibble. Shortlisted for the Ditmars. This middle grade novel tells of a world where bees have gone extinct and the role of pollinating fruit trees has now been taken over by young children. All 9-year-old Peony wants to do is be a bee. She’s worked hard on the farm and is on the verge of achieving her dream. Then her mum comes to take her to the city. A heartwrenching book in places, but one that nevertheless contains a great deal of beauty and hope. 27. The Silver Well by Kate Forsyth and Kim Wilkins. Shortlisted for the Ditmars. A collection of short historical fantasy based around a sacred well and its accompanying village in England. As with any collection, there were some stories I enjoyed more and some less. The experience of the authors shows, however. I enjoyed the way it was structured, with the beginning and the end forming a frame in the present and each of the stories in between reaching deeper and deeper into the past. 28. Children of Blood and Bone by Tomi Adeyemi. Review forthcoming. 29. The Sisters Mederos by Patrice Sarath. Reviewed here. 30. Rose Tears by Amanda Pillar. The first in a new urban fantasy/paranormal romance series. Lori Hardcastle is a half-breed Succubus destined to inherit her Sidhe father’s formidable magic. As a consequence, she’s had a target painted on her back from a young age, but she’s never had to deal with anyone like Conrad Death, the White Queen’s “cleaner”. The chemistry between the characters was excellent, but there was a bit too much focus on plot over character for my taste. Still, a quick, fun read. 31. In the Dark Spaces by Cally Black. Shortlisted for the Ditmars. A sci-fi YA about a young girl who is taken prisoner when aliens attack the freighter she’s stowed away on. Bren MacDibble is the author’s MG nom de plume and the books share a very distinctive voice. If I thought How to Bee was heartwrenching, In the Dark Places stomped all over my feelings. It is about grief, trauma, capitalism, family and belonging. It also does an excellent job of making the aliens seem both alien and relatable. Highly recommended. 32. On a Cyborg Planet by Anna Hackett. Sci-fi romance. A novella in The Phoenix Adventures series, set after the fourth book. After surviving an attempted coup, Axton must secure his leadership as Prime of the planet Centax by recovering a priceless artefact. When he teams up with CenSecs operative Xenia, sparks fly. Short and steamy, though I wasn’t entirely sold on Axton’s characterisation. However, it made a very good palate cleanser between YA sci-fi thrillers/horror. 33. Illuminae by Amie Kaufman and Jay Kristoff. First in The Illuminae Files and a reread to prepare me for the last book. It stands up well to rereading; being less tense about what’s going to happen, I was able to pick up on more of the clever details. A Cup of Salt Tears by Isabel Yap. When a young woman’s husband falls deathly ill, she turns to a Kappa for help. This came across my radar in the wake of The Shape of Water and while there are some similarities, the power dynamics are very different and rather darker. It’s an uneasy story, beautiful but melancholy. Nebula short story nominations by various authors. I read through these for a forthcoming Skiffy and Fanty podcast, so check that out to hear some of my thoughts. HOORAY I am extremely excited that you have discovered Rose Lerner because of me. She’s the best! And not to overpromise, but Sweet Disorder is maybe my least favorite of all her books — not because it’s not amazing as hell (it is), but because all of her books are amazing as hell and the rest of them are even amazinger than this one. High praise, indeed! I’m looking forward to the rest of the series. I think I’ve got it all except the last book. Thank you for the recommendation. It really was delightful.